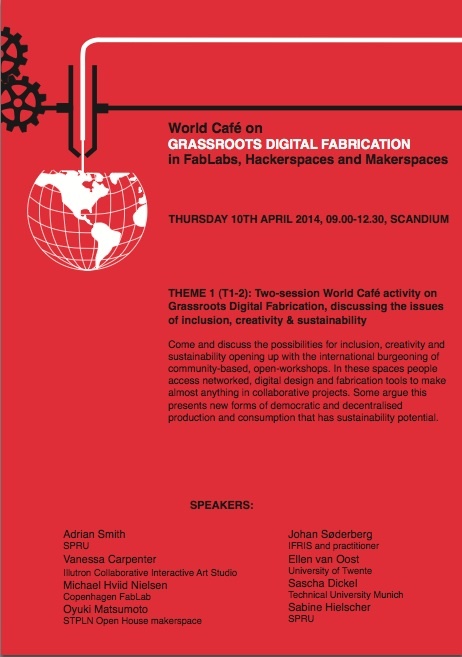 On Thursday 10th April we will be organising a World Cafe discussion about grassroots digital fabrication as part of the Living Knowledge Conference in Copenhagen. You can download the poster here. The aim of this workshop is to use a World Café format to guide participants through three critical issues associated with developments in grassroots digital fabrication: sustainability; inclusivity; and creativity. The session brings together a mix of practitioners and researchers familiar with makerspaces and grassroots digital fabrication; and people less familiar with the topic specifically, but able to bring insights from other areas of innovation in civil society. The workshop will begin with makerspace practitioners from Copenhagen and Malmö explaining what they do and sharing their experiences. Then the World Café discussion begins over the critical issues of sustainability, inclusion and creativity.